This week, Caardvarks is having a Micro Challenge to use a certain color combination on a card. Your Next Stamp is the sponsor and is offering a lovely stamp set to the winner, so hop on over to Caardvarks to check out the details. 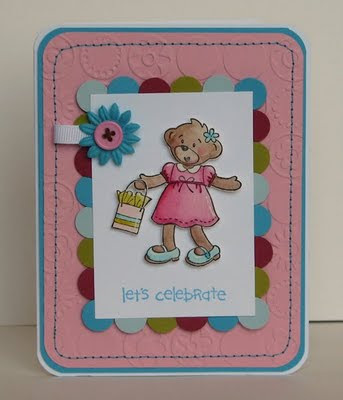 Cardstock, stamps, ink, circle punch: Stampin' Up! Also, I am a day late on getting blog candy posted, but I will have some up by the end of the day today. I love the bear image and how you used the circles around it! Very cute!!!! !